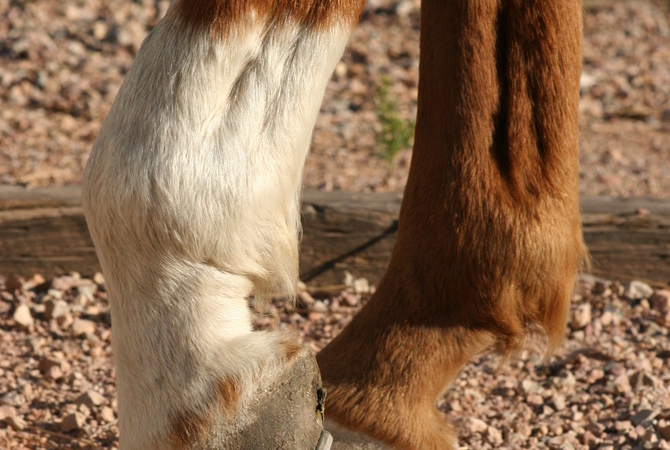 Horse with one hoof raised off ground revealing lameness. I head out to the barn as the sun is just brushing the horizon, whistling to let my girls know I am coming, hear the familiar good morning nicker from my lead mare, Nan, and then she limps into her stall. The flash of panic before the calm sets in, and then I sigh as this event, when it happens, always seems to hit the day before I am due to leave for a competitive trail event. A hoof abscess is a localized bacterial infection in the sensitive structure of the hoof. © April Raine | EquiDesis, LLC. I walk into her stall, looking for the worst possible injury, and there is nothing. Then the light bulb goes off - the beginning stages of a hoof abscess. The funny thing is that I rarely know when Nan has had an abscess in a rear hoof until the tell-tale line appears on her hoof once the abscess has blown, and in her rear feet the abscess always seems to vent on her coronary band and on the front of the hoof. However, she consistently suffers from a more severe issue with abscesses in her front hoof, and it is always the same hoof. 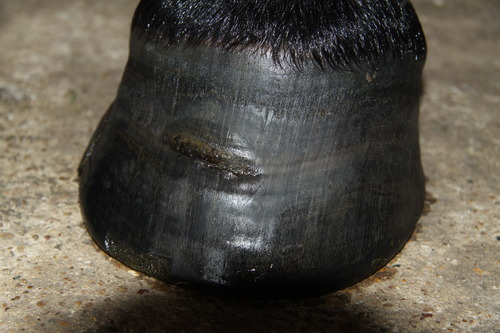 Whatever the reason for the development of the abscess, it is important to know that since the hoof cannot expand, the increased pressure of the pus collecting within the hoof capsule, created as the body reacts to the infection, causes what can be significant pain to the horse. As each day passes, the pus finds and takes the path of least resistance to relieve the pressure and will usually work its way up the hoof wall, normally breaking out at the coronary band, although the abscess can also break through the bulbs on the heel. You can see how uneven the heat is in the coronary bands. The one on the left (facing you) is the hoof with the abscess. On two of her most severe abscesses I have even had thermographs performed (see image at left). After the new hoof grew out, there was a period of about 18 months where the mare suffered three major abscesses in that particular hoof. Once I realize that I am dealing with an abscess, I begin treatment. If your horse is shod, you will first need to have the shoe pulled and then, with hoof pincers, try to more accurately pinpoint the sorest area. I recommend that, even if you are going to treat the horse yourself, you start with an appointment with your farrier and veterinarian, at the same time if possible. If you can find the black line (which is what the infected area looks like), then it may be possible to actually create a hole in the sole or the white line area to allow the infection to escape. If the infection is located and a hole is created, a lot of times a blackish or brownish, nasty-smelling fluid (pus) will ooze out. Once the hole has been created, you will need to keep the hoof clean, packed, and bandaged for several days to a week, depending on how long it takes for the lameness to disappear. The first week, I give her a 15-minute Epsom salt bath in hot water twice a day, using a soaking hoof boot that I bought through one of the online horse supply stores. (It has proven to be a very worthwhile purchase.) I then clean and dry the hoof, pack it with Mag 60 Paste (a poultice that my vet gives me), put a gauze pad on top, and wrap her hoof in vet wrap, taking care not to wrap too tightly and cut off blood supply. I then take duct tape and create a secondary wrapping over the vet wrap to help it last the 12 or so hours I need it to. I also start her on a gram of Bute once a day (recommended by my veterinarian). Then, I keep her turned out in a large, but controlled, area by my barn. Continued movement, not stall rest, is what helps the abscess express and relieve the pressure. Nan’s abscesses have taken up to 14-21 days to come to a venting point. Some hoof traumas can take years to grow out. 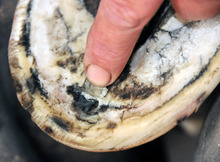 This image shows evidence of the abscess in the hoof wall two years later. If I go into week two, I soak her hoof only once a day, make sure that the hoof is FULLY dry (to prevent other issues from taking place), pack with the poultice, wrap, and repeat every 24 hours until I see her take full weight-bearing steps. Then every morning, when I unwrap her hoof, I start looking for the venting hole in either the coronary band or her sole. If the abscess vents in her sole, I keep her hoof clean and wrapped until I see the hole closed and it becomes obvious that it is no longer going to need wrapping or cleaning. This can take up to a month or more. It is my belief that Nan’s repeated abscess issues are the result of a HUGE traumatic injury she sustained almost two years ago. That injury was caused by a six-inch wooden splinter that penetrated her coronary band and nicked the artery in that hoof. The veterinarian ended up literally cutting away a sizeable section of the hoof wall in order to remove all of the splintering. After the new hoof grew out, there was a period of about 18 months where she suffered three major abscesses in that particular hoof. Since a hoof takes so long to grow out, the last of that injury (it has been over two years now) has almost grown out and the last abscess she suffered is about ¾ of the way down her front hoof. Severe droughts followed by heavy rains never bodes well for horses prone to hoof ailments. To date, she has had only rear hoof abscesses. The weather in Central Texas, where Nan and I live, has been severe drought followed by heavy rains, and that type of weather pattern never bodes well for horses that are prone to hoof ailments. Nan's abscesses exclusively happen in either a black hoof or the black section of the hoof, so the old wives' tale about “white” hooves being weak is just not true in this case. To lessen your chances of having a hoof abscess, you should maintain your regular farrier schedule, as hooves that are not kept in shape are more vulnerable to injury. And when you do notice an abscess, act promptly in consulting your veterinarian and farrier. Be prepared and have the supplies you will need on hand to treat the problem. Miriam Rieck is neither a veterinarian nor a farrier, and as such the reader should rely on and consult with a horse care professional, such as a veterinarian or farrier, concerning the proper care of this ailment on your horse, including the selection of wraps, boots, or other actions related to any information provided in this article. You may also learn more about hoof health by reading Quick and Easy Rules for Maximum Hoof Health.